When we ask students to write an essay, we’re looking for them to develop an argument and draw evidence from scholarly sources to support that argument. Developing an online exhibit can achieve similar goals as an essay in that it can answer a research question and provide a thesis – an answer to that research question – but in an online exhibit, your students can use both primary and secondary digital material to curate and prove their thesis in a public, online forum. In this way, an online exhibit assignment can achieve the “weaving” together of text and other media that digital humanist Mark Sample (2010) has advocated for. Students can use multiple forms of digitized media to develop and communicate a position, because with DHSS we are innovating, remixing, weaving, building, and designing, not just creating a linear argument. This woven, curated, argument can then be presented to the public. Moderate. The selection of materials and how they will be “read” will be difficult elements of this assignment. Depending on the tool/technologies your student uses, this could also be difficult. (Note, however, that York University Libraries has provided support for using Scalar if you are also interested in this technology.) A way to counter both difficulties is to encourage students to follow a five paragraph model as a way to present their materials. An exhibit outline has been provided to support this approach. All four of our students created exhibits through this project, but Denise Challenge’s mini-exhibit “Locating Children in Caribana” was designed the most like an essay your students could replicate in a course. A child dressed as fruit. Kenn Shah’s Caribana photographs. 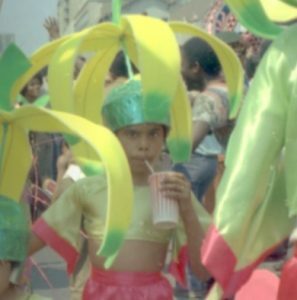 Just like if she was writing an essay, Denise started her exhibit with a research question, which was: How do the photographs of Kiddies Carnival founder Kenn Shah demonstrate the different ways children “officially” participated in Caribana from 1967-1977? As a way to exhibit her findings, Denise then created a “carousel” of primary source images that provided evidence for each of these locations. Denise created her exhibit, and her fancy “carousels,” with Scalar, an online exhibit tool. York University Libraries has provided support for using Scalar if you are also interested in this technology. Omeka is also a popular online archive and exhibit software, and York University Libraries have also hosted a number of digital exhibits using the Omeka platform. However, an exhibit does not have to have a lot of bells and whistles to tell an intriguing story; the Archives of Ontario’s online exhibit “Dear Sadie: Love, lives, and remembrance” is a good example of this. An digital exhibit is essentially a visual essay based on primary sources and thus only needs a platform to demonstrate its research question, thesis, and a breakdown of its argument into different areas supported by evidence. So, your students can use a standard web-hosting site such as WordPress , Blogger, or Google Sites to post their exhibit, but they can also use non-online options such as Powerpoint or even Word to demonstrate their argument and the positioning of materials. In our project, to keep the focus on developing an exhibit that is organized like an essay with a thesis, or “so what,” we developed an exhibit outline form to guide students’ work. You’ll notice that this exhibit outline is very similar to an essay outline, and this was not an accident. For a DHSS assignment, especially for faculty and students new to DHSS, mimicking a familiar essay structure helps with adapting and developing the new DHSS elements into their final assignment. This outline was designed to keep students focused on the relationship between their question/topic, the breakdown of their exhibit pages, the evidence they will use to support their thesis, and their imagined audience for the exhibit. Having this outline meant our conversation about exhibits constantly refined and defined the elements of students’ argument and how they were curated in the online space. Because Denise’s work involved the identification, digitization, and metadata creation of the Kenn Shah‘s archive and the development of her digital-essay, “Locating Children in Caribana,” Denise provided little textual explanation for each position. However, if your students are already using materials that have been digitized, you could require them to write more text or incorporate an additional element, like an Oral History Digital Story or Map, into the exhibit. You could also design a collaborative exhibit for your whole class to engage in where each student would develop one page to support a larger project. 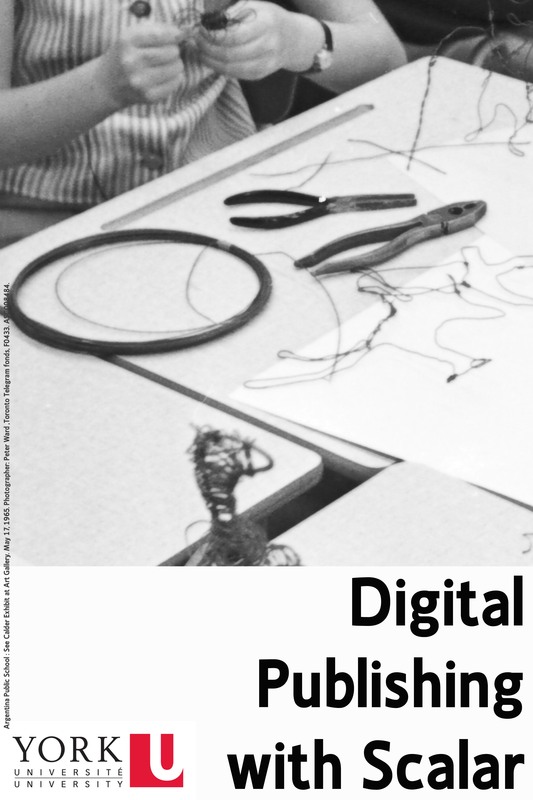 See the York University Libraries’ Pressbook on Digital Publishing with Scalar and Planning and Selecting for Digitization for more support on the larger parts of this assignment, as well as our examples page for exhibits created through or inspired by our project. Online Exhibit by Samantha Cutrara, PhD, for the Office of the Vice Provost Academic, York University is licensed under a Creative Commons Attribution-NonCommercial-NoDerivatives 4.0 International License, except where otherwise noted.